The Red Army had large numbers of anti-tank guns throughout the 1930s, and was World War Two progressed it was clear that combating tanks was a key objective if the Motherland was to be liberated. During that war the Soviets adopted an unusual policy of making any artillery piece a potential anti-tank gun, and suitable ammunition was produced for many types of gun. This set includes three such weapons, all at the light end of the scale. As can be seen above each box contains four carriages, each of which has a choice of three gun barrels. The barrels, working from top to bottom as pictured, are the 45mm anti-tank gun M1937, the 45mm anti-tank gun M1942 and the 76mm infantry gun M1943. The M1937 first saw action in the war with Finland in 1939, and proved effective against the light Finnish armour. When faced with the heavier tanks of the invading Germans in 1941 it proved to be too light, however, although it remained in production until 1943, when sufficient better types were available. Over 37,000 were manufactured, and while we could not find technical specifications for this weapon the model here looks to be quite accurate if inevitably a little simplified. The carriage on which it rests is a little more problematic in that most examples of this gun would have had wired-spoked wheels rather than the steel disk wheels provided, but overall it is a very nice model. To remedy the increasingly inadequate penetration of the M1937, the Soviets produced the M1942. This was essentially the same gun but with a much longer barrel, which did indeed improve penetration, but not by much, and again it quickly fell behind in the race with the ever thicker armour of the German tanks. Still well over 10,000 were made, and many saw service well beyond 1945, particularly in the hands of Soviet allies in wars in Korea and the Middle East. Again this barrel is a little simplified but a pretty good model and everything is correctly sized. Another nice model, and this time the carriage is more appropriate for it. In 1943 the Red Army took delivery of a new infantry support gun, the 76mm M1943. 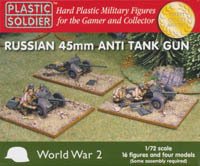 In fact this was a 76mm barrel on the old M1942 carriage, so Plastic Soldier have used this opportunity to include this third type of barrel also. Another light weapon which therefore had its limitations, it was still made in numbers and served well enough. Regarding the model however the barrel is much too long, being 25 mm (180 cm) in length when it should be only about 17 mm (125 cm). As before though this one-piece barrel looks pretty good if simplified. The four crew poses with each gun are all kneeling, and all require a fair bit of assembly (see image of the sprue). Separate arms help to make the poses quite natural and also allow some scope for variance in pose. Two of the poses seem to be holding a shell while another has his hands up in a generic 'handling the gun' sort of way and the fourth is pointing and presumably in charge. All wear standard Red Army uniform, and all have the common canvas bag/pack on their backs. Two have the rolled greatcoat and two helmets, although as these men are in action we would have liked to have had enough helmeted heads for all the figures. Sculpting of guns and figures is nice and clear although the latter do have the rather bulkier look that Plastic Soldier give to all their figure sets. None of the figures have a base, and while all do stand on their own feet some separate bases would have been a nice touch. The accessories amount to some shells, boxes and weapons, all of which add to the package. The best thing about the set is the choice of guns, which does much to improve its appeal. The guns are pretty good for easy-build kits and the crew figures are fine. The incorrect barrel size of the M1943 is disappointing however, particularly as the discrepancy is enough to be quite visible when compared to the real thing. We also thought the kit should have included optional wheels with wire-spokes, which would have been particularly appropriate for the earlier guns. Still what there is is properly turned out, and this provides some very useful light anti-tank guns for a hard-pressed Red Army.